A lightened up, brightened up version of chicken parm that won't weigh you down, but still gives that same satisfaction of juicy chicken, melty cheese, and savory tomato sauce. 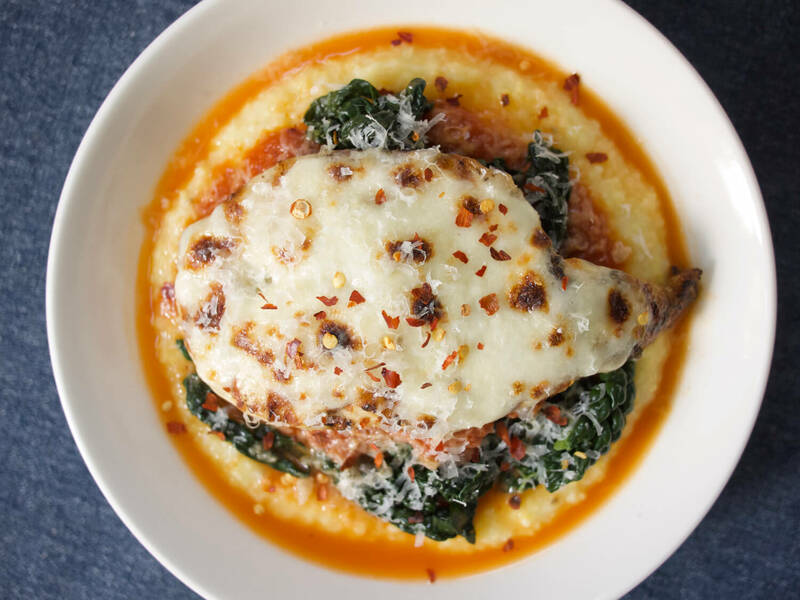 Chicken parm is the perfect meal except for one thing -- it almost always requires a nap afterwards. This version makes use of the grill rather than the frier to lighten things up a bit, but a marinade made with various Vanns herbs, olive oil, and lemon zest keeps the chicken juicy and tender. A rich and spicy tomato sauce keeps this dish in Red Sauce Italian territory, while the addition of tender, garlicky kale makes this a complete meal, though if you want to make a Caesar salad on the side, we won't mind at all! First, prepare the chicken, using this method to turn the breasts into 4 cutlets. If your breast halves came with tenders attached, remove the tenders and pound separately, or reserve for another use. Place the chicken in a bowl or other container and add the thyme, oregano, basil, garlic, lemon zest, olive oil, and salt to taste, around a teaspoon or so. Cover and refrigerate until ready to grill. Next, make the tomato sauce. Heat olive oil and garlic over medium heat in a medium saucepan until garlic begins to sizzle gently, 1-2 minutes. Add crushed red chili flakes and cook until garlic begins to turn a light golden color, 2-3 more minutes. Add oregano and basil and cook for 1 more minute, stirring. Add tomato paste and cook, stirring, until paste has softened and is no longer separate from the oil, about 3 minutes. Add pureed tomatoes, stir to combine with seasonings and oil, and bring to a simmer. Lower heat to maintain a simmer, stirring occasionally, until sauce is reduced slightly, no longer watery, and tastes rich and delicious, about 30 minutes. Add salt to taste. While sauce simmers, get the grill ready. If you’re using a charcoal grill, light one chimney full of coals. When coals are covered with gray ash, pour into one side of your charcoal grill and set grilling grate into place. Cover for 10 minutes, and then clean and oil grate. If using a gas grill, heat grill on high for 10 minutes, covered, and then clean and oil grate. While grill heats, cook kale. Heat oil in a medium-large skillet over medium-high heat until shimmering. Add garlic and cook until fragrant, about 1 minute. Add kale and a splash of water (about 1-2 Tbs.) and cook, stirring, until wilted and tender but still a rich green, about 7-10 minutes. The water should evaporate completely by the end of the cooking time. Remove skillet from heat and set aside. Have marinated chicken and fresh mozzarella slices ready at the grill. If using a gas grill, lower temperature to medium-high. Place chicken pieces directly over the hot side of the grill, cover, and cook until chicken is about halfway cooked through, about 3 minutes. Flip chicken, arrange slices of mozzarella on top, and cook on the second side until cheese is melted and chicken is cooked through - the thickest part of chicken should read 165°F on an instant read thermometer, about 2 minutes. Transfer to a serving dish or other container. To serve, spoon polenta or spaghetti in shallow serving bowls. Spoon a healthy portion of tomato sauce on top, followed by a mound of kale. Place grilled chicken on the very top and sprinkle each dish with grated Parmesan. There’s a small restaurant chain in Los Angeles called Zankou Chicken that is well known for its super secret chicken shawarma recipe, which is crispy and juicy and beautifully spiced and comes with a crazy-good garlic sauce that will make your breath reek for at least the next few hours if not days. A smoky, spicy braised chicken that makes for the perfect taco filling. A lightened up version of the classic curried chicken salad. Spicy, savory Italian sausage, earthy kale, sweet caramelized onions, and creamy potatoes combine with chicken stock and a sprinkling of parmesan and black pepper to create the perfect cold-weather soup. Here's a warming braised chicken dish to brighten up your dinner on a cold evening. Packed with Moroccan spices, preserved lemons, and briny green olives, this dish offers a punch of flavor with relatively little effort. It's almost Memorial Day, and you know what that means -- time to take the cover off your grill, stock up on the charcoal and propane, and fill your grocery cart with your favorite pieces of meat and grillable vegetables. The earthy spice of Vanns Harissa, slight green bitterness of Vanns Celery Seed, and heat of Vanns Aleppo Style Chili Flakes bring some excitement to tender roast chicken, with sumac-marinated red onions adding a pop of brightness. A warm spice blend and bright lemon zest and juice bring juicy chicken, fluffy basmati rice, and tender broccoli together in this one-pot meal. Make this simple dish on a Sunday and you’ll have a flavorful, juicy protein to toss in your lunch salads or serve as part of your weeknight dinner for days.